Google’s Android Market continues its unending flight to success. With Brand new applications added like live wallpapers, widget apps, soundboards, ring bones and other intriguing stuffs Android Market has surely emerged as the next big thing in the market. Officially Google proclaim the number of applications as 100,000. No matter what it claims we know it is not the exact figure and the actual figure is much higher. Wondering how much high is it? It is actually beyond our imagination. 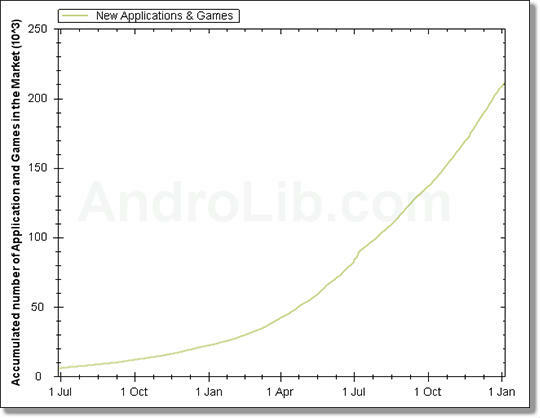 Recently Androlib.com has anticipated the exact figure of Google’s Android Market’s application as 200,000. Google has not confirmed this enormous achievement yet. However the entire technical growth is illustrated in its eventful graph. Apple’s Application Store is no more considered the invincible name in the market. Google’s Android Market is giving Apple a neck to neck competition with its more than 200.000 applications. You can anytime discover a new milestone in this breakneck race as the numbers of apps are growing every second. One more interesting fact has been found in the whole scenario. It is found more than 2.5 billion apps are being downloaded from the Android market itself. If we take the figures mentioned by the Andro Lib’s report as accurate, it indicates the rapid success rate of Google’s Android Market. It is almost doubled within two months of duration. Apple’s app store has more than 300.000 applications so far, thereby chances are there within next spring Android Market will catch its pace. There are several reasons behind this huge success. Android is now being ranked as the number 2 mobile operating system in the world. It is yet to beat the outstanding record of Nokia. Google has most proudly declared that it is activating more than 300,000 Android phones daily. It leads to a striking number of nine million Android smart phones each month. A huge number of manufacturers have also been constantly working behind the Android Phones success. Smart phones like Motorola, HTC and Samsung and many more are using Android in their mobile phones. In comparison Apple falls short with its iPhones, iPads and iPod Touches. It is believed to activate slightly less devices than Google. 2011 will surely add some more feathers to the cap of Google’s Android Market. With multiple Android phones getting more and more popular amongst the consumers around the world it will surely reach its height of success in the forthcoming years. With goofy stuffs like high profile smart phones, coolest applications and perfection in detailing it is getting irresistible day by day. It surely is a clear threat for all other competitions in the market.